Light character is a great help in life. It would seem that after Gauguin exhibited Signac from the Impressionist exhibition, and Monet met him extremely coldly after an enthusiastic letter, Paul Signac (Paul Signac) had every chance to turn away from painting forever, and even from the Impressionists — for sure. It was also possible to become a psychotherapist’s patient, so that the rest of his life could deal with injuries and heal a subtle mental organization, and if he approached the canvas, he would protest against everyone at once. But Paul Signac avoided this, the psychotherapist’s couch can be removed, no need. He loved the sea, painting, travel, and even, do not believe, people. A strong loving family (Paul is an only child), the absence of financial problems and the support of relatives created a sufficiently strong internal support that allowed such moments to be perceived as unpleasant moments (with whom it does not happen) and not key events. Paul’s father was the owner of the shop and managed to provide for the family in such a way that they didn’t have to need it even after his death — he died when his son was 17 years old. At first, mother was not delighted with the path chosen by her son, especially since he studied well, in the humanities in general he drew the attention of teachers with a special talent and could get a more "sensible" profession. But after graduating from the College of Rollin, Paul said that his only interest was painting. He did not even want to hear about the School of Fine Arts, he was not nice to academism. 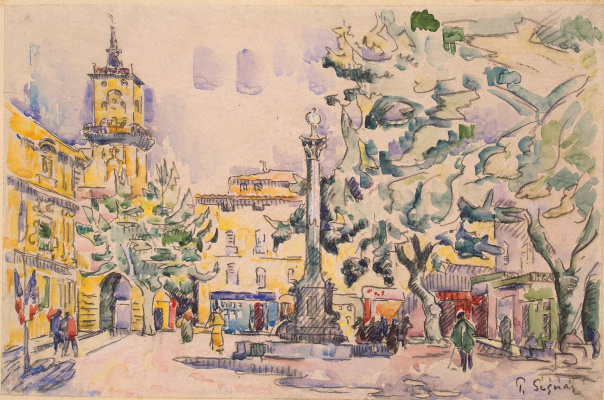 There is no court, the mother of Paul Signac decided and soon became the most ardent fan of his art. Famous letter Claude MonetPaul wrote in 1885. He confessed to the maestro of sincere admiration and asked for a meeting. Alas, an inspired young artist ("I came to him as a messiah! ", — Signac later said, completely did not touch the great impressionist, in the character of which there were no mentoring features at all. Not that Signac was somehow particularly unpleasant to him, it was just that Monet was seriously interested only in his own painting. Therefore, other acquaintances had a key influence on the development of Signac as an artist. Names Georges seuraand Paul Signac is most often pronounced together. 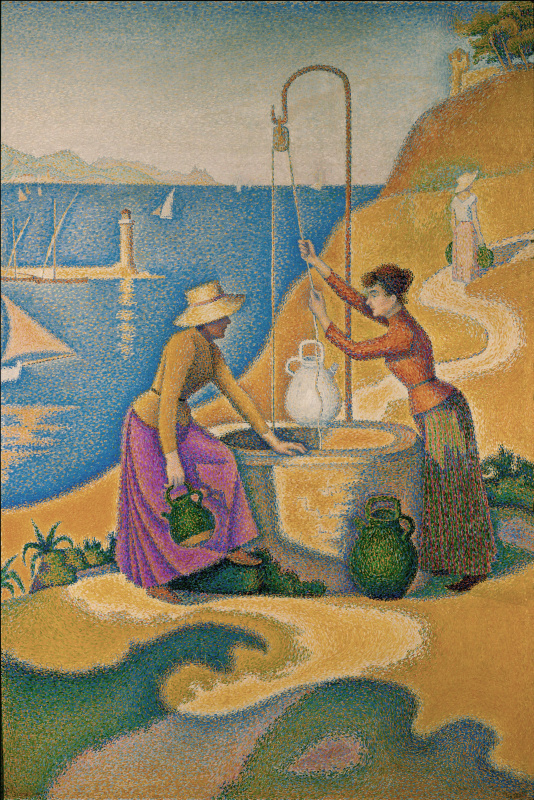 They met in 1884, and Seurat immediately enticed a friend with his technique pointillism— is a method of writing a picture by means of adjacent points of pure contrasting colors. Also this direction was called divisionism and neo-impressionism — the last version of Seurat and Signac liked more than others (Signac even wrote portrait of the critic Felix Pheneon, the author of the term "neo-impressionism"). 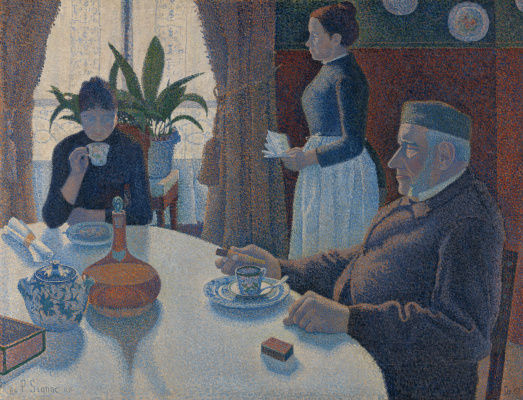 Unlike the outgoing follower, Georges Seurat was a man of withdrawal and not at all friendly, so the credit for popularizing pointillism belongs to Paul Signac. Soon he even briefly joined neo-impressionism. Camille Pissarrowhich, in contrast to Monet, who was passionate about his own work, also tried to support young artists. 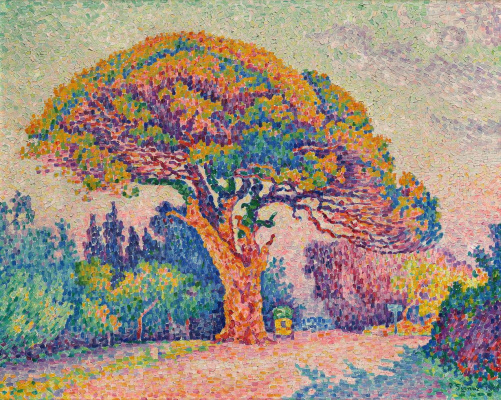 Signac and Pissarro had a particularly warm relationship, and later Paul even married his distant relative Bertha Roble. 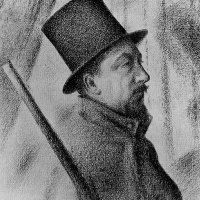 A loyal friend and admirer of Georges Seurat, Paul Signac was disarmed by the sudden, premature death of the leader of neo-impressionism. He did a lot to prevent Seor from being forgotten — he took apart his work, gave several retrospective exhibitions, and soon wrote a study. "From Delacroix to Neo-Impressionism". However, paying tribute to his mentor, the artist himself soon after the death of Seurat said goodbye to neo-impressionism. "I hate the point and the dryness more and more"— he writes after a few years. 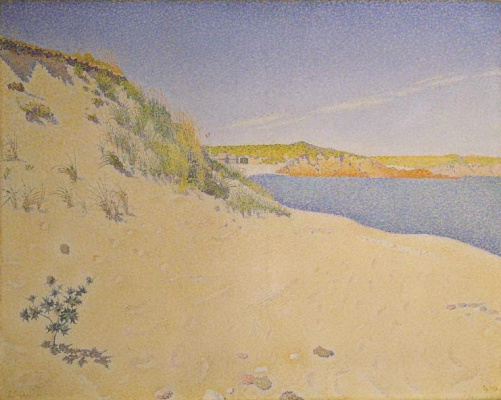 Having passed through the technique of pointillism and abandoning it, Signac will find its own style. He most often continues to follow the theory of combinations of contrasting colors as a way to create light, but dots are replaced by strokes. However, the difference is not only in replacing the point with a smear. Emotional, sensitive, light Signac was alien to Seor’s scientific, rational approach. He said that he subordinates colors and lines to the mental movement that he wants to convey, and does not embody the scientific theory of a combination of contrasting colors. Paul Signac bought the first yacht in 1883 and did not call it any kind of "Seagull" or "Victory". On board was inscribed "Mans — Zola — Wagner". 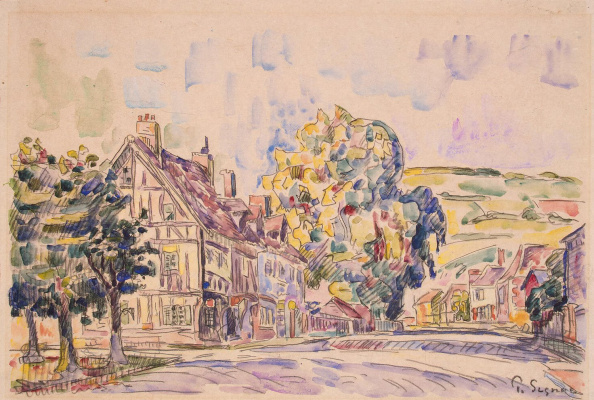 Paul Signac not only in painting was strong, but also understood and loved literature, yet it was not for nothing that his humanitarian abilities praised him in his youth. Signac was a friend of many writers, and in his workshop, which was much more comfortable than most of his fellow colleagues, because financial problems were unknown to him, poets, writers, artists gathered and often lingered until morning. 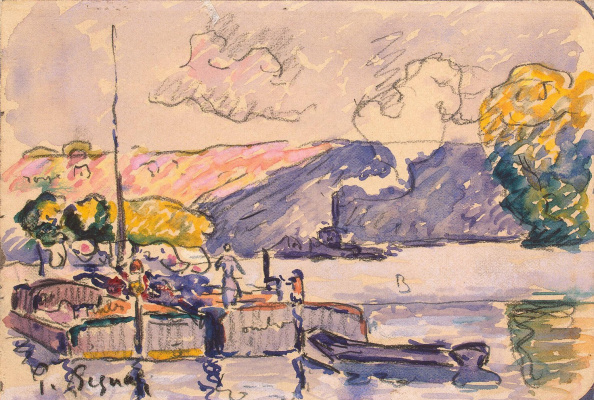 During his life, Paul Signac changed 32 yachts. He loved to travel, the yachts were idle. The well-known signac marinas written not from the shore, but from the sea.Even his death caught him almost on a journey — at the age of 72, almost immediately after returning from Corsica. Standing in 1882, his house was in the paradise of Saint-Tropez — Signac was very fond of the sea and could not live far from it, he quickly began to yearn in Paris. 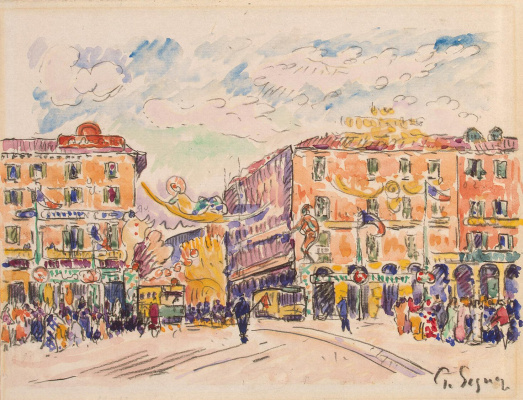 The traditional image of the genius separated from the crowd, Paul Signac, was also violated in that he was actively interested in public life. He sympathized with the Soviet government, considered the pictures painted in the spirit of social realism, bright, joyful and colorful. In 1933 he even wrote a preface to the catalog of the exhibition of Soviet artists in Paris. However, his enthusiasm for social realism and his favor for socialism did not reflect on his painting — his paintings were still as bright, light and radiant, "apolitical." Signac and the Fauvists have good relations, especially with Matisseand Marcheand with artists Nabi groups. An amazing feature — the easy nature of the artist made even his creative process open. To him in the workshop could easily enter at any time home and friends. The process of writing pictures was for him not a painful anguish, as for many colleagues, but a joy and a pleasant inspirational state, which it was quite possible to share with others. Not that the quarrelsome character was an indispensable attribute of a self-respecting artist, but such lightness is still a unique phenomenon. 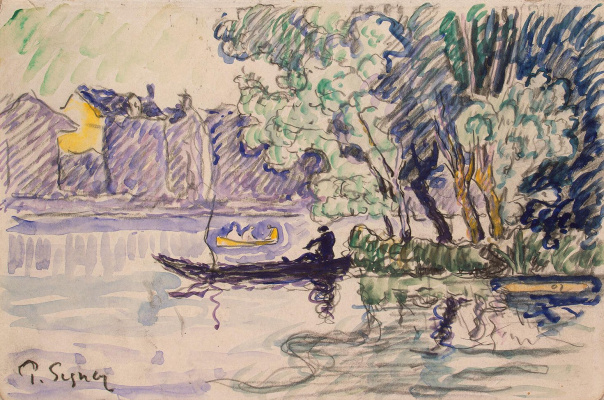 Writer Vayan-Couturier said about him: "Signac loved art, humanity and the sea". Perhaps this is a rather capacious characteristic.